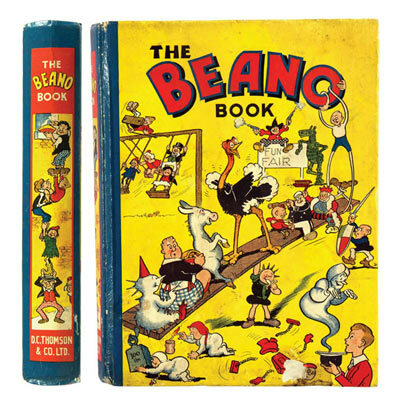 The star lot of our June auction was this wonderful copy of the first Beano Book, found in a Cancer Research charity shop in St Andrew's, Fife by eagle-eyed volunteer, Matthew, who had just come in to the shop to help dress the windows. 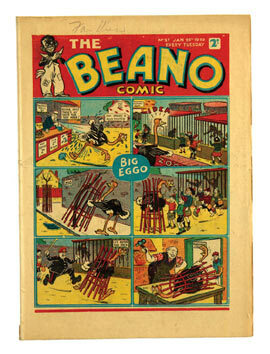 Conservatively estimated at £1500-2000 it was soon to become the second highest priced Beano Book ever sold by us (2004: £4,500). 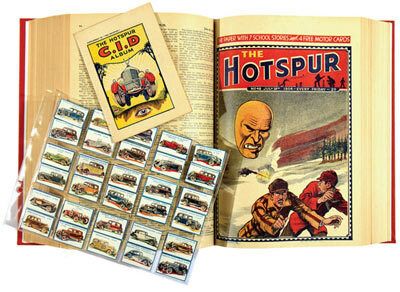 The winning bidder, a keen collector from London, will be keeping the book safe for his young son in the years to come. 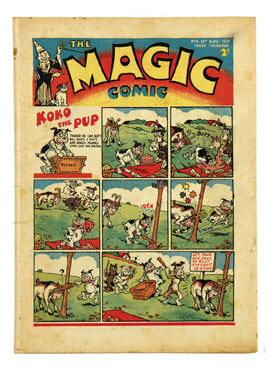 Beano comics from the war years always attract strong interest as so many collectors vie for them. 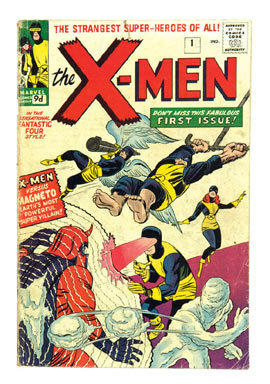 The two particular issues above were in very fresh condition with issues 27 at £247 and 100 at £253. 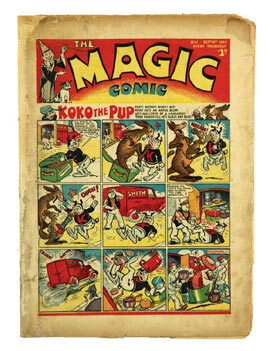 As many of our customers know, Magic Comic was the young sibling of Beano and Dandy and only lasted for 80 issues before being subsumed by the two family elders. Rare because of this, Magic's early demise in 1941 also rendered the title forgettable from a collectors' point of view but such is the thirst for all things D C Thomson values remain stubbornly high. No2 made £220, No3 and 4 £187 each and No 61 £127. 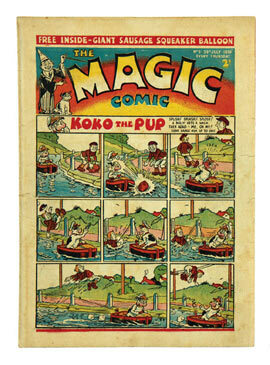 It featured the first story of Gulliver by Dudley Watkins. 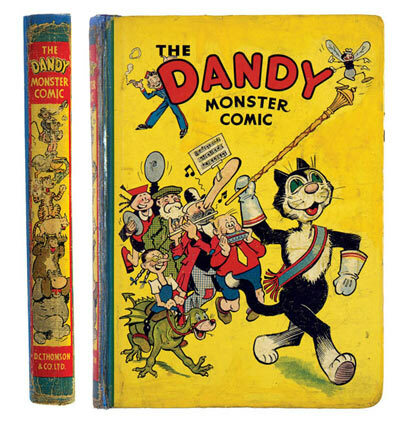 Dandy's highlight in this auction was a professionally restored copy of The Dandy Monster Comic of 1941, its original spine illustration laid on to a new spine with neat colour touching to the boards and strenghthening to the corners. 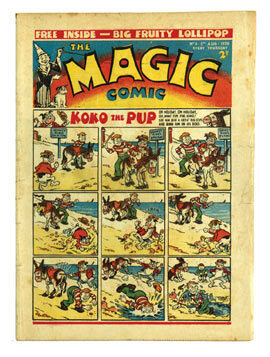 £495 restored order to Korky's Marching Band. 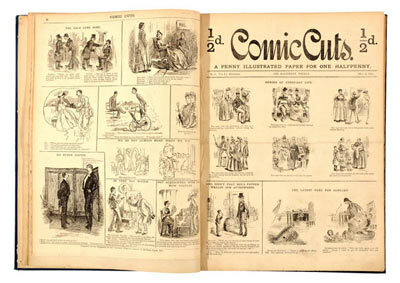 When Comic Cuts come up for sale, these late 19th century issues are often ripped at their edges (they were originally printed as one sheets and cut and folded in to eight by hand) and tanned and brittle with age. Not so this unbroken run from 1-26 of publisher's file copies which were extremely well preserved in their contemporary binding. Although well over estimate, the winning bidder knew exactly what he was getting for £600. 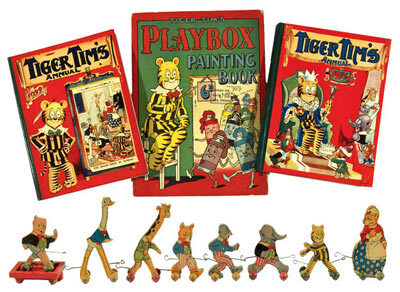 Tiger Tim was a hugely popular character in the Twenties and Thirties and his pals The Bruin Boys marshalled by their ever clucking mother hen, Mrs Bruin were read and enjoyed by kiddies for several generations. Not only were the first six annuals in fresh condition along with a Painting Book, they were accompanied by a wooden toy train set of Tim and his chums all on wheels with a spare luggage cart to boot. This is now occupied by Porky Pig, having lost his wheels, although not his appetite, which may have been the cause. £240 pulled away with these rarities. 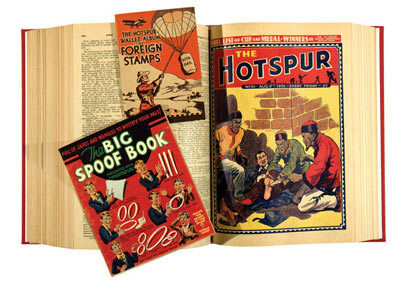 Hotspur was featured strongly in this catalogue running right through to the war years. 1934 and 1935 complete years illustrated above were in very high grades and collected £330 and £385 respectively whilst 1941-45 ranged between £100-170 per year. 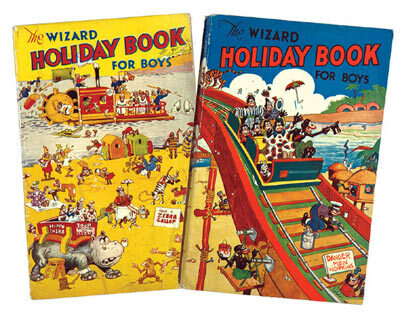 Here were two little beauties, The Wizard Holiday Books for 1938 and 1939. Hard enough to find individually these fresh copies, produced as soft backs and illustrated by the brilliant Chuck Gordon, conjured a wizard £404. In 1939 Amalgamated Press secured the reprinting rights of Superman from DC Comics, the first UK exposure of The Man Of Steel. 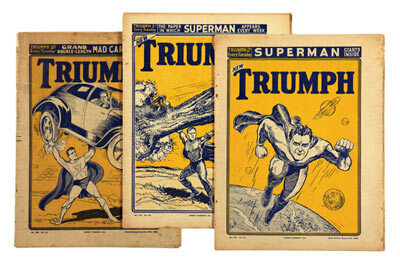 Although Triumph's centre pages exactly mirrored his early US adventures, the covers were illustrated by AP staff artist, John McCail, and if you wanted to believe a man could fly, this wouldn't particularly help you. However these issues are strongly collected and £440 certainly helped Kal-El off the ground. 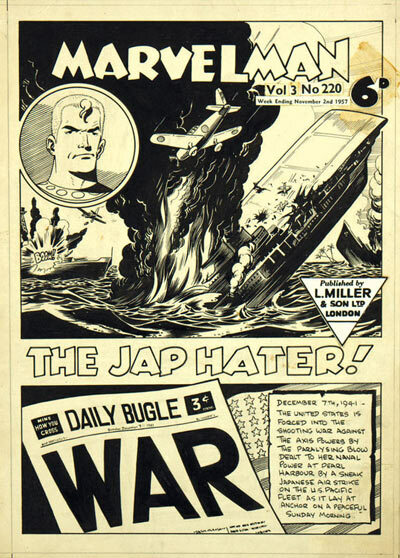 In the early Fifties Mick Anglo created Captain Marvel for Fawcett / L Miller but Superman's publishers, the said DC Comics didn't like this and sued the London publisher over copyright. After a heavy pressure payout the Cap flew off, but undaunted, Mick returned to the drawing board, rubbed out the original cloak, gave the lad a blonde rinse and this sorted out the Supermen from the boys so Marvelman could fly the UK skies. His artwork is rare and this iconic 1957 piece illustrating the Japanese attack on Pearl Harbor was taken to £469. 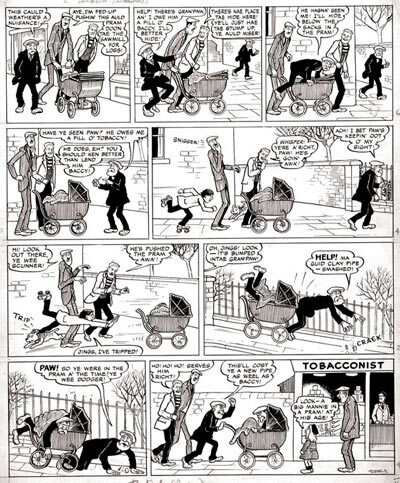 This Broons board, drawn and signed by Dudley Watkins had Paw owin' Granpaw a fill o' baccy and hidin' in a pram to avoid payment. Payment of £450 was not avoided for this 1968 wheeze. 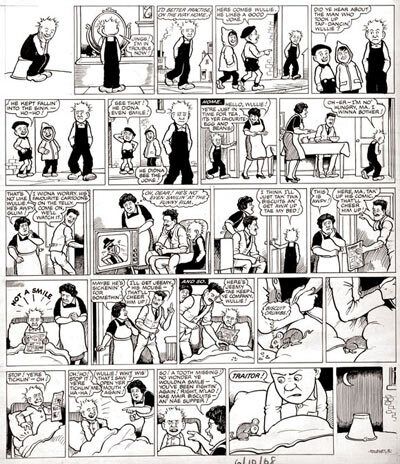 Oor Wullie's been fightin' agin and he canna show a tooth missin'. Not even his pals' jokes or his favourite TV cartoons or The Beezer can make him smile until his pet mouse, Jeemy, does the trick - now he's in trouble. His smile might have broadened for £683 as well. 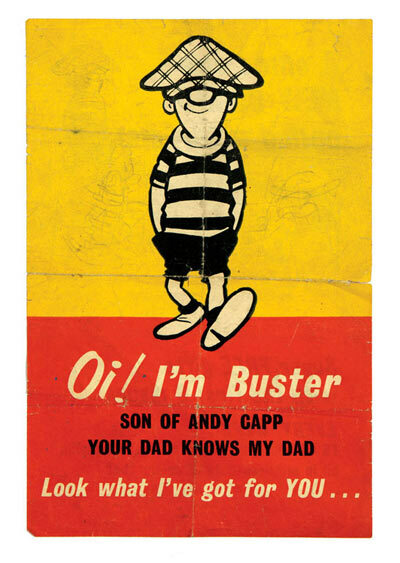 This worn double sided flyer for Buster No 1 was used as a draw lining until sent in to us for appraisal. We suggested No Reserve, our bidders educated us with £132. Top drawer. Ken Reid's Frankie Stein is always pining for his Daddy and he brings home a prezzie for the prof, The Ram-Bam Surprise - suddenly the pantry door is hanging open with Dad hanging from it. £475 let him down gently. Solo came out as a spin-off to the wildly successful TV Century 21. 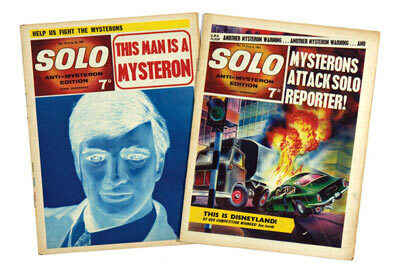 This lot included The Mark Of The Mysterons by Don Harley and £225 found these issues flying solo. 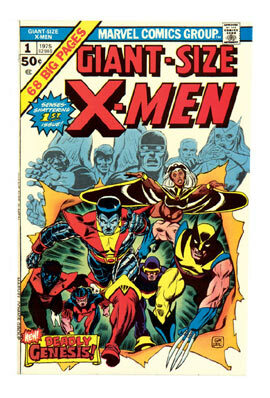 John Burns is a well collected artist whose art encompasses TV 21, Lady Penelope, Jane, Modesty Blaise and Judge Dredd. 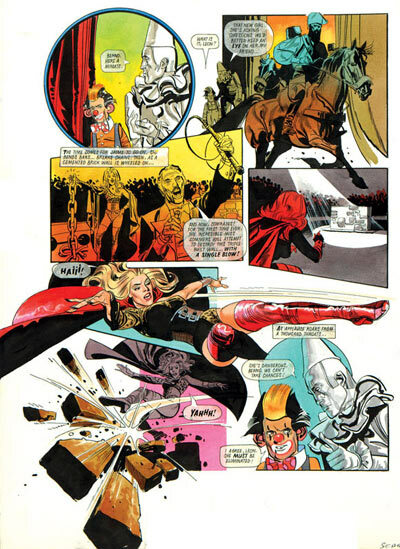 This action page of Jaime Sommers, The Bionic Woman karate-kicked £250 to the canvas. Hai. 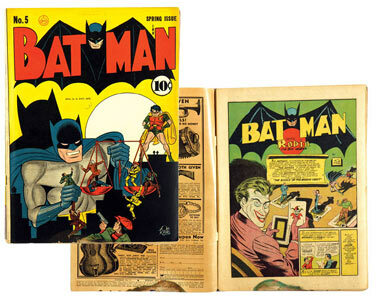 Our US section opened with an early Batman issue, No 5, which although stained through the lower margin pages had the classic Scales Of Justice cover. They weighed in at £440. 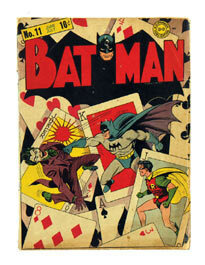 Well worn with pin gouges you still can't fool The Joker and £238 fixed his smile on Batman 11. 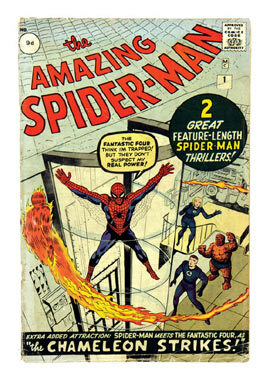 Peter Parker's first adventure in this professionally restored copy of Amazing Spider-Man 1 continued the enduring love affair between him and his collectors at £770, Meanwhile the mutants pleased professor Xavier with a [gd+] £276 for X-Men 1 as The X-Men Giant-Size first issue from 1975 Stormed to £511. 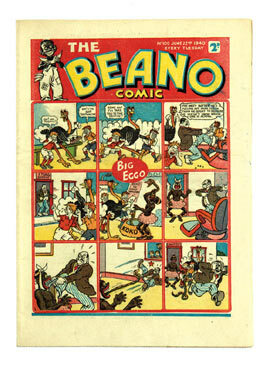 Last Saturday it was arranged that I would deliver the charity Beano Book No 1 to its new owner in London. Whilst out and about in the morning I thought I would find a quiet place for a coffee and look for the last time at some of the early adventures of Big Eggo, Pansy Potter and Tin-Can Tommy so brilliantly preserved in this high grade copy. Walking in to a small, out-of-the-way cafe at the back of Knightsbridge, I plonked the papers on to a comfy table and went up to the counter to order. Returning with my cappuccino and a sandwich I found three elderly ladies sitting there, one of whom had picked up my paper, deeply immersed in the financial section. When I suggested that this was My table and My paper, the first lady said frostily (imagine The Queen's voice) 'we didn't see anyone sitting here', the second thrust her stick in my face saying she was very tired from walking round Harrods and the third offered that if it was my table, why wasn't there a 'reserved' sign on it? I know when I'm beaten and wilting under the Harrodan gaze of these SW3, I picked up the rest of the papers and moved grumpily to a cramped corner cubicle with a 'so I should think' clipping my ears. Unbeknownst to me the manageress, a long-suffering soul, had witnessed the entire episode and she came over to me insisting that my 'gentlemanly' behaviour warranted a complete refund on the coffee and sandwich and in addition brought over a fresh slice of apple pie as an extra thank you for giving up the table. Still under the steady glare of The Knightsbridge Three I gingerly took out the Beano Book with a secret smile knowing that Lord Snooty And His Pals would at least share my free slap-up feed.